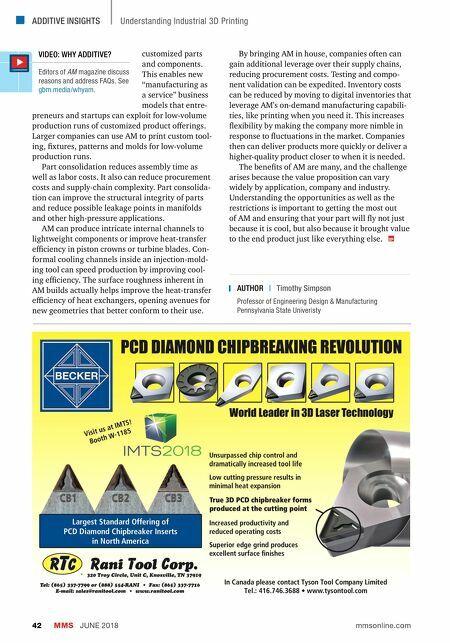 ADDITIVE INSIGHTS MMS JUNE 2018 42 mmsonline.com Understanding Industrial 3D Printing customized parts and components. This enables new "manufacturing as a service" business models that entre- preneurs and startups can exploit for low-volume production runs of customized product offerings. Larger companies can use AM to print custom tool- ing, fixtures, patterns and molds for low-volume production runs. Part consolidation reduces assembly time as well as labor costs. It also can reduce procurement costs and supply-chain complexity. Part consolida- tion can improve the structural integrity of parts and reduce possible leakage points in manifolds and other high-pressure applications. AM can produce intricate internal channels to lightweight components or improve heat-transfer efficiency in piston crowns or turbine blades. 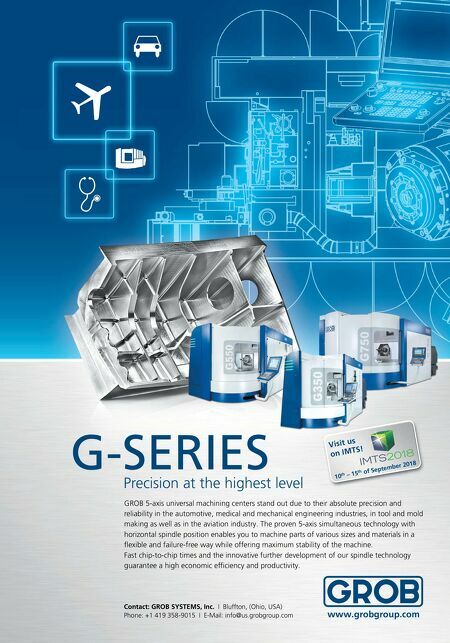 Con- formal cooling channels inside an injection-mold- ing tool can speed production by improving cool- ing efficiency. The surface roughness inherent in AM builds actually helps improve the heat-transfer efficiency of heat exchangers, opening avenues for new geometries that better conform to their use. By bringing AM in house, companies often can gain additional leverage over their supply chains, reducing procurement costs. Testing and compo- nent validation can be expedited. Inventory costs can be reduced by moving to digital inventories that leverage AM's on-demand manufacturing capabili- ties, like printing when you need it. This increases flexibility by making the company more nimble in response to fluctuations in the market. Companies then can deliver products more quickly or deliver a higher-quality product closer to when it is needed. The benefits of AM are many, and the challenge arises because the value proposition can vary widely by application, company and industry. Understanding the opportunities as well as the restrictions is important to getting the most out of AM and ensuring that your part will fly not just because it is cool, but also because it brought value to the end product just like everything else. AUTHOR | Timothy Simpson Professor of Engineering Design & Manufacturing Pennsylvania State Univeristy VIDEO: WHY ADDITIVE? Editors of AM magazine discuss reasons and address FAQs. See gbm.media/whyam .